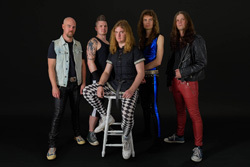 Sweden's Starblind returns with a third studio Never Seen Again, and introduces a new singer, Marcus Sannefjord Olkerud (Ex-Rocka Rollas). 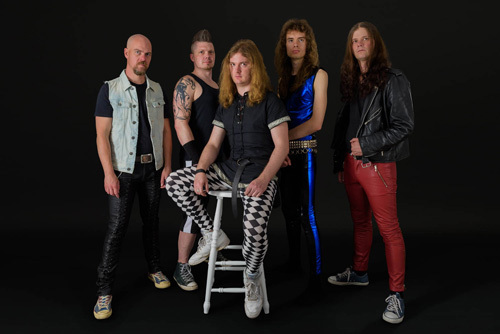 Starblind also returns to channel the spirit of early Iron Maiden, more specifically that era around Piece Of Mind and Powerslave. So essentially, excepting a change of vocalist, there's nothing new under the sun with Starblind. Actually, you could read my review of Dying Son, then merely swap out the name of the vocalist, pick a few choice new songs from this album, and you'd have a summary of Never Seen Again. But let me break it down, just in case you don't want to take the lazy man's way out. Essentially, the strength of Starblind comes in their music. Their elemental strengths are twin guitar harmony, abundance of killer metal guitar solos, the galloping pace, and the simple fact that, when these things are combined, the arrangements sound epic. 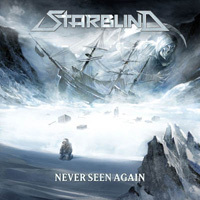 Starblind knows "keep it true" heavy metal and plays it with enthusiasm and precision. And for better or worse, depending on how much you worship the almighty Maiden, they do sound like that seminal NWoBHM band. The wild card once more is the new vocalist. Not unlike his predecessor, Olkerud also sings clean and melodic, his voice tuned to the melody and harmony of the arrangement, and he can go screamo too. In the former case, Olkerud is steady and reasonable, especially in songs with lighter parts such as Eternally Bound. In the screamo scenario, he's not necessarily out of control, but definitely harder to understand. If he's trying to sound like Bruce Dickinson, I don't really care. I never that Bruce was the greatest vocalist anyway. (Stop your grumbling at that comment.) Mostly Olkerud can be easily overwhelmed by the music, with the mix and mastering not doing him any favors. Basically, the bottom line for me was simple: I really like Starblind's interpretation of Maiden-inspired traditional heavy metal, especially loving the guitar work. After that, I merely forbear with the vocals. As for the songs, like I said earlier, they're all pretty epic and entertaining with favorites being The Everlasting Dream of Flight, The Last Stand, Never Seen Again, and the aforementioned Eternally Bound. Basically, the bottom line for me was simple: I really like Starblind's interpretation of Maiden-inspired traditional heavy metal, especially loving the guitar work. After that, I merely forbear with the vocals.